Hi no Hikari sae Todokanai Kono Basho de” (陽の光さえ届かないこの場所で In This Place Where Even The Sun’s Light Doesn’t Reach) is an upcoming single by Miyavi on January 16, 2008. The title track features miyavi’s fellow in “Skin”, Sugizo. This one here is from the regular edition, because the limited one is without the instrumental part. Although it gives a music video and making of footage. 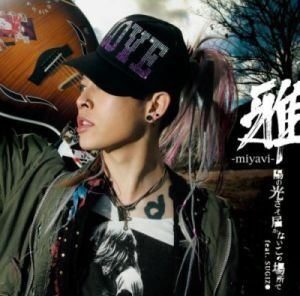 I am not a big fan of Miyavi, I don’t really like him too back then. But hearing this single made me think the other way. It’s terrific!!! It’s hard to think that someone this young could be so talented. The first time I decided to hear this single is because of Sugizo is in the song and Sugizo is a really big part in the title track. The sound of the guitar, the crazy whammy playing and the long sustain are definitely that of Sugizo. This single is great. I like it very much! Or should I say that I really love it^^!! This single is a must have! !